Servicing Kitchener, Waterloo, Cambridge, Guelph, Elmira, New Hamburg, Wellesley, Listowel, Stratford, Brantford, Woodstock and surrounding areas. We specialize in providing service to anything from a single family dwelling to large apartments or commercial premises. 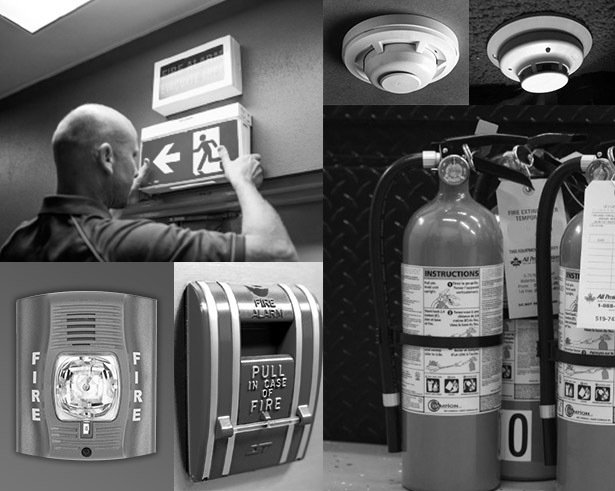 Let us look after all of your life safety systems including fire alarms, fire warning systems, smoke alarms, fire extinguishers, emergency/exit lighting, fire safety plans and fire extinguishers. All Protect specializes in monthly and annual testing of your emergency lighting and exit lighting systems. All equipment is documented on our inspection reports and the test results recorded. Our service vehicles are equipped with most common parts so we can repair any items at the time of inspection. We offer complete fire extinguisher and fire hose inspections, service, maintenance and supply of new components. All service is performed in our service facility located in Waterloo, ON. We're always here to help out however we can!